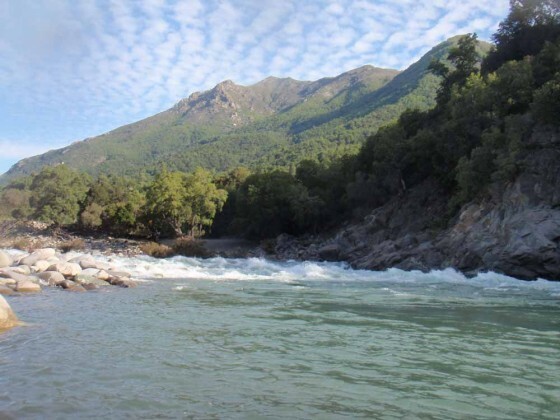 Four hours northeast of Chile’s second largest city Concepcion, near the small town of San Fabian de Alico lies the River Ñuble. 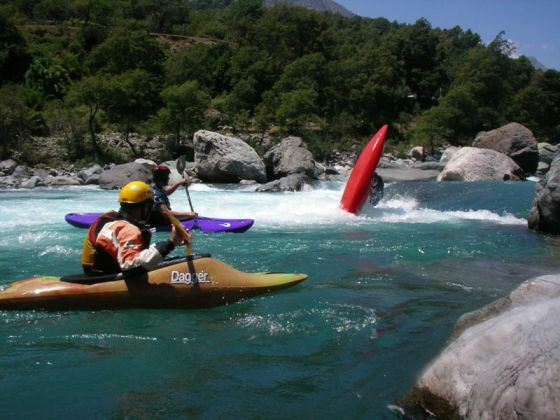 The Ñuble is a beautiful turquoise blue river offering class 3 and 4 action with long pauses of flatwater in between. The Río Ñuble drains Cordilleras Los Tabanos and La Ventana, as well as the north side of Nevados de Chillán (3212 m). Somewhat reminiscent of the Bío-Bío’s Cien Saltos Canyon, the Ñuble is a favorite among rafters. Its boisterous, whitewater and great camping make it a delightful overnight raft trip less than a day’s drive from Santiago. A typical run on the Ñuble could be divided into an upper, a middle, and a lower section. An upper Ñuble run would be 14 km section of class 3 and 4 with long stretches of flatwater taking about an average of 4 hours. A middle Ñuble section would be another 15.3 km with more class 3 and 4 sections interspersed with more flatwater. A lower principally class 3 “town run” is roughly 9 km long. A typical upper Ñuble run would actually start on the colder and creekier Rio de Los Sauces. To reach this put in follow the road from San Fabian along the river Ñuble until it comes to Los Sauces. Continue upstream several km then put in on Los Sauces (elevation 715 meters) and boat a few km into the Ñuble. The takeout of upper stretch is at El Caracol which is 18.9 km upstream of San Fabian at elevation 600 meters. The average gradient in this stretch is 8.2 mpk or 42 FPM. Best run in peak spring runoff with flows of 10,000 CFS but also runnable without the push in the summer months with flows under 1000 CFS. The middle stretch is from Caracol 18.9 KM upstream from San Fabian to the takeout at Camping San Ignacio 3.6 km upstream of San Fabian at elevation 435 meters. 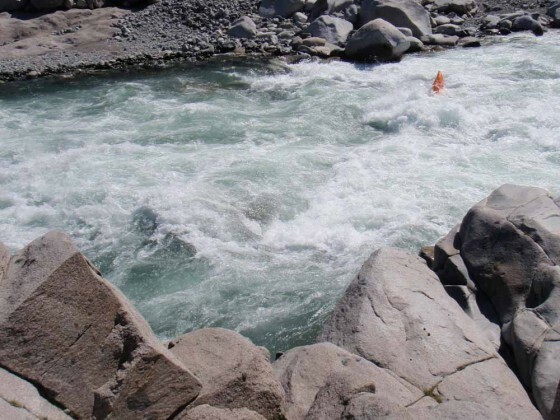 This stretch has more continual whitewater than the Upper with plenty of challenging rapids such as one named “rapid without a line”. The average gradient in this stretch is 11 mpk or 55 FPM and best run a high water spring flows. The takeout for the lower stretch is about 5 km below town where an obvious turnoff reaches the river. The put in is any access point upstream with a good option being camping San Ignacio 3.6 km upstream of town making for a 8.6 km, fun 2 hour run. To get to the Ñuble one takes I-5 or the panamerican highway north of Chillan for 30 km until the town of San Carlos. From San Carlos keep going straight through San Fabian then pick your section.